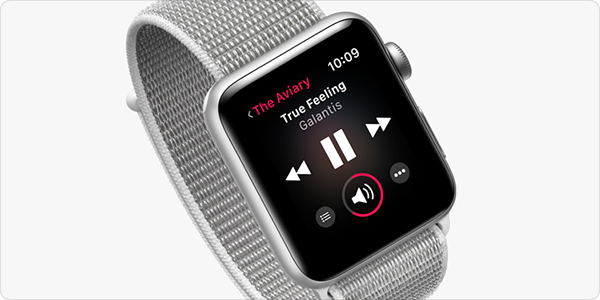 You can even use the Apple Watch to listen to music. 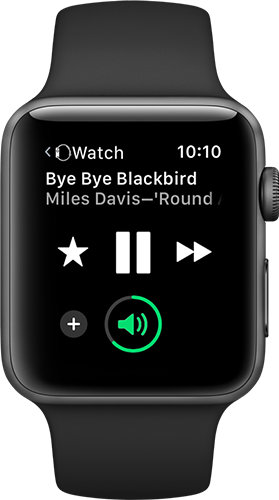 There are three ways to do this: with the iPhone, with music synced to the Apple Watch, or by streaming directly to the Apple Watch. Here's how to play music on the Apple Watch. The Apple Watch is designed to be tethered to your iPhone (though that has changed with the Series 3 cellular model; see below). When you use the watch like this, it acts as a controller for many apps on the iPhone. As such, you can play music on the iPhone and control it on your watch. To do this, just start playing music on the iPhone, in the Music app, or any other app that can play music (or any podcast app). The iPhone may play to headphones that you've connected to your device—either by wire or via Bluetooth—or you may be streaming music via AirPlay to a speaker or amplifier. On the Apple Watch, open Now Playing in the Dock (press the power button to access the Dock). You can also access Now Playing, if you've added it as a compliment to any of your watch faces. This shows you the album (in bold), then the song and artist of the currently playing track. If you see the phone icon at the top left, this means that it's controlling playback on the phone. You can pause and play by tapping the center button, and skip forward or backwards with the appropriate buttons. You can also change the volume by moving the crown on your watch. 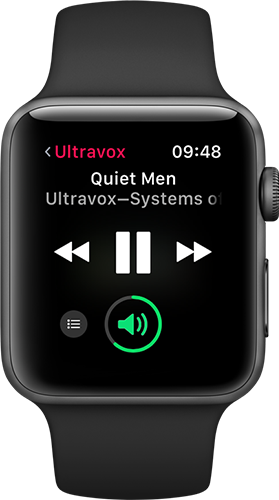 Using the Now Playing controller on the Apple Watch is a great way to manage your listening session when accessing your phone isn't easy, such as when you're running on a treadmill or riding a bike. 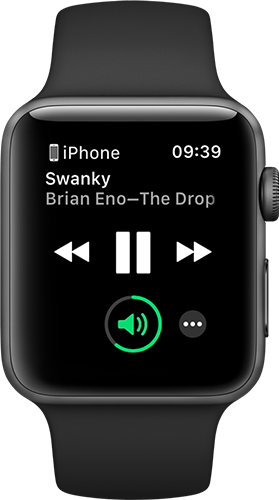 You can also sync music to your Apple Watch, so you can play it directly from the device. Go to the Watch app on the iPhone, tap Music, and you'll see options to automatically add certain playlists, if you have an Apple Music subscription (Heavy Rotation, New Music Mix, Favorites Mix, and Chill Mix). Below, you'll see Add Music. Tap the + button to select other playlists, albums, artists, and more, from your music library, to sync them to your watch. Note that syncing music to an Apple Watch is very slow, and only occurs when the device is on its charger. So you can't just decide to add an album before you go out for a run; it's best to do this beforehand, overnight. When you've done this, you can play music using the Music app on the Apple Watch. In this case, the Now Playing controller won't show the phone, and will instead show the album or playlist you're listening to at the top left. Tap that to return to the main list. Tap the small Up Next button to see what's coming up in your album or playlist. Control the volume with the crown. Playing music on the Apple Watch itself requires Bluetooth headphones. Apple's AirPods are ideal for this, because they automatically switch from your phone to your watch when you change playback device. With other Bluetooth headphones, you'll have to pair them to the watch in Settings > Bluetooth. To listen to music like this, you can tell Siri to play music by your favorite artist; or ask to listen to a specific album; or even start a radio station, such as Beats 1 or another station you like. You can also go to the Music app, tap Library, and browse for music. Or you can tap Shuffle All at the top level of the Music app to listen to a mix of all the music in your library. One good way to listen to music is to tell Siri to "Play my radio station," or just "Play some music." This starts your Personal DJ station, which plays music from your library, tracks you've purchased, or tracks that you've played or liked on Apple Music. 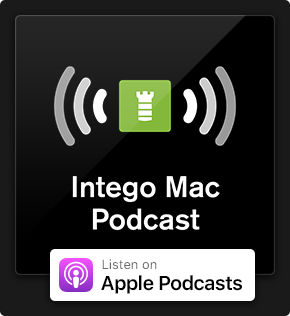 When you listen to an Apple Music radio station, you'll see that the display is a bit different. The star lets you tell Apple Music that you want to hear more songs like the current song, or fewer. The + lets you add the track to your library. And you can play, pause, and skip ahead, but not back. No matter which method you use, as long as you have your Apple Watch handy—and Bluetooth headphones—you'll have music whenever you want. 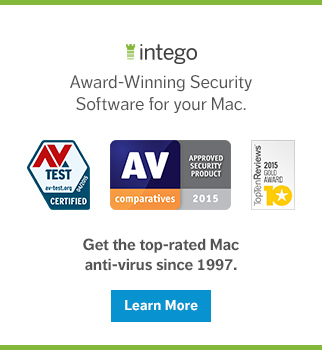 This entry was posted in Apple, How To and tagged Apple Watch, Music. Bookmark the permalink. I have been searching high and low for an answer but cant find it. Is there any way to play apple music on you watch while still connected to your phone. Lets say I want to play something that isn’t in my music library but is on Apple Music and I want to play it as I go on a run. I want to start playing it while I am in the house which I will still be connected to the iPhone. How do I get the music to play from the watch and not the phone? To me it is a pain to have to wait till you are disconnected from your phone to start playing Apple Music. I know you can turn off bluetooth on the phone to disconnect the watch but I would more than likely forget to turn it back on when I return.